Sunrise Park on Thursday. It will be partially renovated under a contract approved by the city council Wednesday. Sunrise Park and sections of two major streets — Hill and Oak — are about to be rebuilt, totaling more than $3 million in city public works spending in South Albany this year. The city council this week authorized awarding contracts to the low bidders for all three projects. Sunrise Park is the smallest of the three. Northcore USA LLC of Salem bid more than $354,000 for the job, but the city had budgeted only about $239,000 in federal antipoverty funds to pay for it. The job was reduced by cutting out some concrete work, and the company’s contract will be for $259,500. Another $60,000 to $70,000 is available for playground equipment and park furniture, and the parks crew will set that up when the contractor is finished. Parks Director Ed Hodney told the council he hopes to complete the construction when money becomes available, but he didn’t know when that might be. 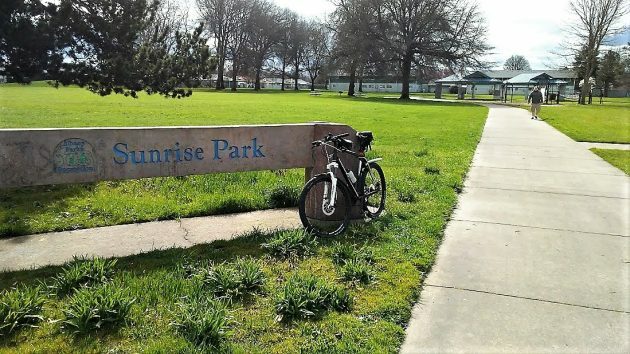 The Sunrise project, intended to make the park more accessible not just to park users but the police as well, calls for a 15-space parking lot off Thurston Street, and a playground at the north end of the site. The existing playground and shelters will be demolished. Wildish Construction of Eugene was the low bidder at $939,785 for the job of rebuilding Oak Street from 34th to 38th Avenue, the segment in front of Oak Elementary School. The asphalt will be ground up and used as a base for the new pavement. The contract also calls for a new storm sewer and a water main along the rebuilt section. Hill Street will be completely rebuilt from Queen Avenue south to 24th Avenue, a stretch of seven blocks. R&R General Contractors of Salem was the low bidder at $1,875,359. The condition of this heavily traveled street has long led to complaints. The city is hoping to do the section south of 24th the following year. There was some council discussion on whether the grant program would be around for another year. If it’s used even partly to make up for the loss of soggy playgrounds, the government may see a reason to cut it back. Is that East? West? South? …or North of city limits? Luv to take a peek. Walk barefooted in said lawn. BS! You know what they say! If it seems too good to be true……. I have no idea what this new plant is or where to buy it; so, Hasso, I hope you explore and write about it.